Scottsdale’s culinary scene includes two new concepts at the Shops of Gainey Village. Jim Maggiore and his wife, Christina, converted the former McCormick and Schmick’s site into a burger joint and seafood restaurant. On one end is Cuttlefish focusing on coastal Italian cuisine with a contemporary menu. Its counterpart, Notorious Burgers serves handcrafted burgers and craft beers while boasting a mobster theme focusing on the family aspect of the mafia. FYI: Joe’s experience stems from his father, famous Phoenix restaurateur, Tomaso Maggiore, who has owned Tomaso’s at 32nd Street and Camelback in Phoenix since 1977. There’s nothing better than biting into a great burger and letting the juices drizzle down your lips and chin. We stopped at Notorious Burgers for a late lunch on a Saturday afternoon. It’s a dimly lit establishment with contemporary furnishings. The tavern area and a whiff of cleaning solvent is the first thing you notice when you walk through the door. The bar is separated from the dining room by a half wall, which is handy to lean against if you’re sitting on one of the black cushioned chairs that lack a back. We were both famished, so we quickly decided on the Lucky Luciano’s Truffle Burger (stilton bleu cheese, bacon, micro arugula, and wild truffle mushroom demi) and an order of sweet potato fries with aioli dressing. Our friendly server, AJ, acted as bartender as well as waitress. Questions about the quality of meat and servings were asked and respectfully answered. It wasn’t a secret that I was there to review the restaurant. DinnerSlut doesn’t ambush, but instead talks with servers about the true purpose of her visit. My expectations are always high, especially after exposing myself as a reviewer and being specific about my likes and dislikes. The burger and fries took about 30 minutes before they were served. I’m not sure why because there were only three other patrons in the restaurant sipping on drinks. A burger served without seasoning, or juices, overcooked and tasteless. The only flavor I could savor came from the blue cheese; even the bacon was thick, tough, and rubbery, lacking any crispness or piquancy. I never tasted the truffle, which has an earthy distinctive aroma. And the arugula scattered on the burger was nothing more than a distraction for what was missing. The sweet potatoes were flavorful and crispy, not too greasy and tasted good when dipped in aioli. It was the only edible food on the table. We talked to the manager, Vincenza, about our experience and she seemed concerned and eager to correct the problem with their burgers. Although this is their main entrée on the menu, they also offer lamb and turkey patties. A waiter who was sitting next to us eating lunch walked up to our table and told us about the milkshakes and the organic cotton candy offered on the menu. 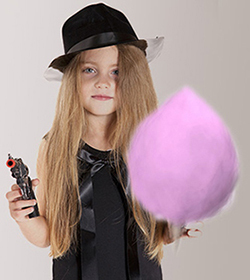 He made a point concerning the ‘organic’ cotton candy. This seemed an oxymoron to us, offering a solid sugar item with an organic twist. Trying to satisfy children’s taste buds as well as connoisseurs of food is not an easy challenge for any eatery. The manager talked with us and mentioned that they were about to change their meat distributor. What I admired about the restaurant was the openness of the staff and their receptiveness to constructive criticism. We promised to give Notorious another chance in the near future. Your writing, full of heart and feeling, simply flows . . . . .